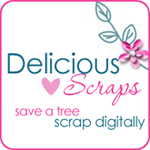 Delicious Scraps: Happy Mother's Day and a Freebie!! Happy Mother's Day and a Freebie!! Just wanted to wish all the Mothers out there a very happy Mother's Day!! Lets all remember, respect and honour our loving Mothers not only once a year but every single day!!! Love you, Mom!! Here is an old "Mother's Flowers" Scrap Kit. Papers and elements are available separately ~ Click on the previews to grab it. I'm so pleased that you would share so many free kits with us. I love your use of bright colors and great embellishments. You make it easy to be a good scrapbook creator with your art. Thank you again for all the hard work you put into each kit. Thanks so much for everything you do. You are the best! I love the bright colors,very cheery. Thank you so much. Thank you so much for this post. I want to let you know that I posted a link to your blog in CBH Digital Scrapbooking Freebies, under the Page 1 post on May. 08, 2011. Thanks again. Mothers Flowers is just delightful! Thank you and happy Mother's Day!!!! Thank you so much for the darling scrap freebie! Thank you so much for sharing so many gorgious free kits. It makes digital scrapping such a joy.